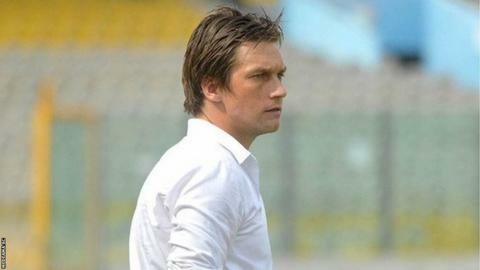 Ghanaian club Medeama have replaced their coach Tom Strand after he went missing following a Confederation Cup match at the weekend. Medeama said Swedish coach Strand "checked out of his hotel room without our consent" after the 3-1 defeat by Mamelodi Sundowns on Saturday. A resignation note was found in his room and the club contacted South African Police to try to locate Strand. On Tuesday, Medeama appointed Augustine Evans Adotey as interim coach. Adotey, who doubles as Ghana's Under-17 female team coach, will be in charge of the Confederation Cup return leg against Mamelodi Sundowns on 18 May. Reports on Tuesday suggest Strand has returned to his native Sweden. In a statement on Monday, Medeama expressed their concern, saying: "The Ghana High Commission in South Africa has also been duly notified of the current situation. "The club is in constant touch and cooperating fully with authorities to unravel the mystery surrounding Strand's whereabouts. "We would like to assure to our teeming fans and Ghanaians to remain calm in these trying times." The 35-year-old joined Medeama in December 2014 and led them to an 11th-place finish in the league last season.